Copycat TacoBell Mexican Pizza lets you skip the drive thru and make this delicious favorite at home! I have the secret to making them taste just right! Copycat TacoBell Mexican Pizza is the drive thru favorite you can now make at home! So we have talked a little about my TacoBell obsession before, I love it, I will not lie lol. I do go there once a week, ain’t no shame in my drive thru game lol. Then I got older and decided it was time to be like the women in my family and try these Mexican Pizzas (sans tomatoes because bleh lol). It was love at first bite. Everything went together perfectly and I get them all the time now, I might just have to pick one up on my next visit lol. I love them so much that I wanted to make them at home and set about figuring out how. Now the ingredients are simple and there were some recipes on Pinterest for them but I could tell just by looking they weren’t going to stack up to the original. See the thing that makes the Mexican Pizza so delicious is its crispy shell. All the other copycat recipes I have seen have you using a tortilla thats been baked till crunchy or those crunchy corn tortilla discs. Neither of these will give you that authentic taste. In order to achieve true copycat perfection you need my secret ingredient and that is refrigerated taco salad shells. They can be a little hard to find and you can certainly use the above methods, but if you can find these salad bowls they make all the difference! I included a picture to help. These are a great quick dinner, everyone loves them. They can be customized to anyones liking and are a great way to use up leftover taco meat. So make a Copycat TacoBell Mexican Pizza for your dinner tonight and skip the drive thru! Brown and drain hamburger and season with taco seasoning. Top with any toppings you like! Can I skip the meat? Of course! Just leave out the meat and these would make a fabulous Meatless Monday dinner! I cannot find the shells anywhere?!?! What should I do!!?? Sadly since I first wrote this post a few years ago Walmart stopped carrying them. However quite a few other stores still do. 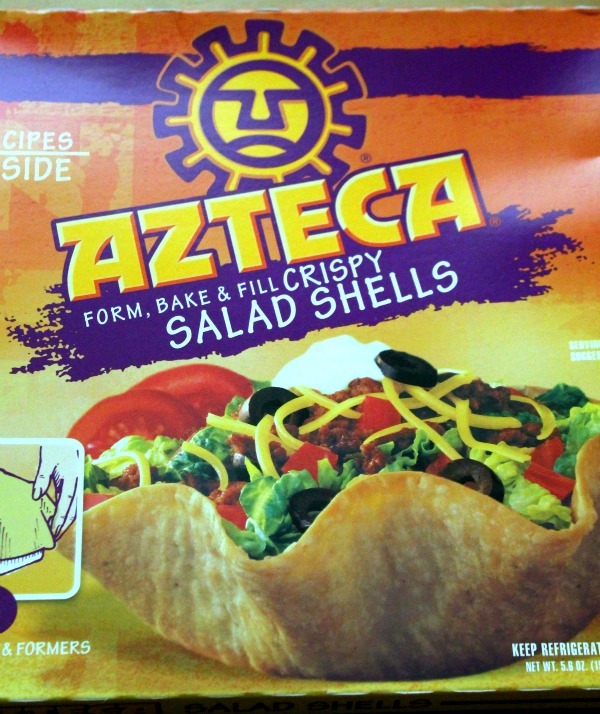 You can go to the Azteca Foods website and use their store locator. You can also buy round crunchy corn tortilla shells that you can also use here. You can also fry soft flour tortillas and use those. Can I spice this up? Sure!! Use a pepperjack cheese on top, add a little heat to the meat seasoning or top with diced jalapenos. Want more copy cat recipes? Check these out! Brown drain and season the ground beef with your favorite taco seasoning. Bake the shells flat in the oven till just golden brown. Spread 2 of the shells with refried beans. Split the ground beef between the 2 shells. Spread 2 T of taco sauce on each of the remaining 2 shells. Lightly broil the cheese and sauced shells till melty. Place those on top of the beef and bean shells. Looks just like the real thing! But there’s no way I would share that with anyone – all mine! I love these!! My experiments didn’t turn out well before, but they will now :) Thanks!! This looks yummy. I’m not a Taco Bell person, but I want to try this. Love me some Mexican pizza! It’s been so long since I’ve had one…I definitely need to do this soon! Thanks for the reminder. I wish I wouldn’t have seen this post because now I’m in trouble. Looks wonderful!!!! yes, yes, and yes. I’m following you. love copycat stuff. great taste, and you can control ingredients! I HAVE TO ADMIT I LOVE TACO BELL SOMETIMES… THIS LOOKS GREAT AND MUCH BETTER FOR YOU! THANKS SO MUCH FOR LINKING UP AT OUR LINK IT OR LUMP IT PARTY! Oh, I haven’t had a Taco Bell mexican pizza in years. Thanks for the recipe…can’t wait to make it. I’m getting all caps on my comment, too. of course this masterpiece was featured at Freedom FRidays!!! Oh yum!! what brand of taco sauce works best? Our local stores actually carry Taco Bell seasonings and taco shells, taco salad shells and soft tacos tortillas). Taco Bell will sell their taco salad shells!!!! You can buy two for less than a dollar!! I had no idea!!! That is awesome! Thanks for the tip! How did you get the salad bowls flat like a pizza? Hi!! They are actually sold flat and come with formers that you bake them on to get the bowl shape.